Miltoniopsis, the Pansy Orchid, is aptly named: the flowers look like a large pansy. The flower's labellum, or lip, usually has an attractive pattern of lines on it. They are often confused with the related (and similar) Miltonia orchids, and many people use the two genus names interchangeably by accident. 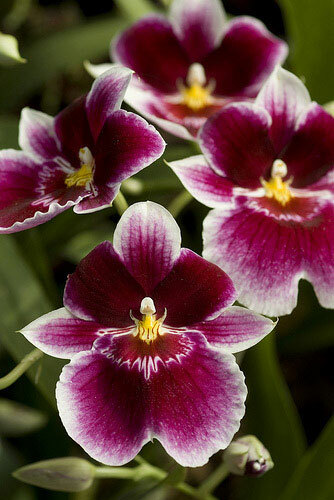 They are both in the Oncidium alliance, and the two genera are occasionally hybridized to produce a Milmiltonia. These orchids originate in South America; there are six species, from Colombia, Costa Rica, Ecuador, Panama, and Venezuela. One difference from Miltonias is that there is only one leaf per pseudobulb. Pansy orchids like intermediate temperatures, ideally 70-80°F by day (21-26C) with a 10-15° drop at night (6-8C). Low-to-intermediate lighting is ideal; provide 1000-2000 footcandles, such as an east-facing or west-facing window, or a somewhat-shaded south-facing window in the northern hemisphere. Phalaenposis lighting works well. The point is to keep the light from being too intense and causing sunburn, so diffuse sources such as fluorescent lights work well. Humidity should be high if possible, 50-70%.